Ever since my teenager’s and my near-death experience (Vol 10, No. 42, “My child, my hero!”), I am truly taking that saying to heart. I take NOTHING for granted now. Not the wind, not the birds flying by, not even a simple sneeze. And more than ever, I want to help others, which makes our time on earth so much richer and more meaningful. I have a new lease on life and am raring to go! And why not? Sure, there are a million horrible things wrong in the world, our country and our city. But there are just as many, if not more, wonderful people, places and things out there, too. This is a gorgeous time in the City of Dallas. All the flowers are in bloom, the trees are turning green again and the sun is shining. Our own community is particularly beautiful this time of year. Dallas Blooms is in full swing on the shores of White Rock Lake at the Botanical Gardens. The Bath House Cultural center is preparing for its annual Lake-a-Palooza! And our very own For the Love of the Lake (FTLOTL) is celebrating its 23rd anniversary! Join other volunteers this coming Saturday, April 13 at 8:30 a.m. for cake, games and even a lesson on how to rescue honey bees. FTLOTL provides trash bags, gloves and pickers to those willing to help clean up around, and in (via kayaks and canoes), our city’s treasured lake. Please take time out of your life to actually enjoy your life. Revel in the little things we all take for granted. And help someone else, even if it means just letting them get in front of you in traffic. 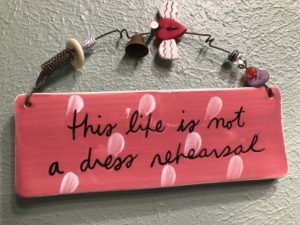 Because this life is not a dress rehearsal — it is the actual show!